Tuning package upgrades the Audi S4 to RS4 levels of power and performance. Austrian aftermarket firm MS Design has revealed its latest project, dubbed the A45, that tunes the Audi S4 to RS4 levels of performance while adding some fresh aesthetic components. The tuner insists its Audi A45 is the closest thing to an RS4 sedan on the road (the actual RS4 only offered as a wagon). First off, the tuner boosted the 3.0-liter TFSI supercharged V6 from 333 hp to 450 hp, which translates to a new 0-62 mph time of 4.5 seconds and an unrestricted top speed of 180 mph. 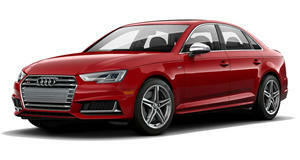 Visual changes to the saloon include an aggressive front fascia housing a genuine RS4 grille while featuring larger air intakes, a lower spoiler and side vents. Other exterior mods include a pair of side skirts, a new rear bumper with air outlets, and a carbon-fiber diffuser complete with twin tailpipes. Chassis upgrades include an MS brake system, a height-adjustable suspension kit, and 20-inch 10-spoke alloys finished in matte black, while inside the cabin has been reupholstered in leather, suede and carbon fiber. The finished product was showcased at Top Marques Monaco last weekend. 2018 Audi S4 Test Drive Review: Maybe Perfect Really Is Possible? This is what happens when straight-A students keep shooting higher.